Enjoy a pleasant trip to Shizuoka from Tokyo in one day. On this tour, you will be able to visit Shiraito Falls and Miho-no-Matsubara, two beautiful sightseeing spots that are located nearby Mt Fuji. This tour also includes a sushi buffet lunch with 18 varieties of fresh seafood and Mt Fuji viewing cruise ride at Suruga Bay. After meeting with our tour conductor, you will head to the first destination of the tour, Shiraito Falls. This waterfall is a gorgeous natural creation that is praised for how thewater flows trickles down from the cliffs like a collection of gentle silk strings which gives it its name ('white silk') in Japanese. You will have 30 minutes to visit and see this beautiful waterfall. Thereafter, you will have a sushi buffet lunch at Yaizu Sakana Center. For 50 minutes, you can eat as much as you can of 18 kinds of sushi such as tuna, sea urchin, or salmon roe. Once lunch is finished, you will head to Shimizu Port for the Mt. Fuji Viewing Mini-cruise ride. From that pleasure mini-cruise, you will be able to enjoy the wonderful views. 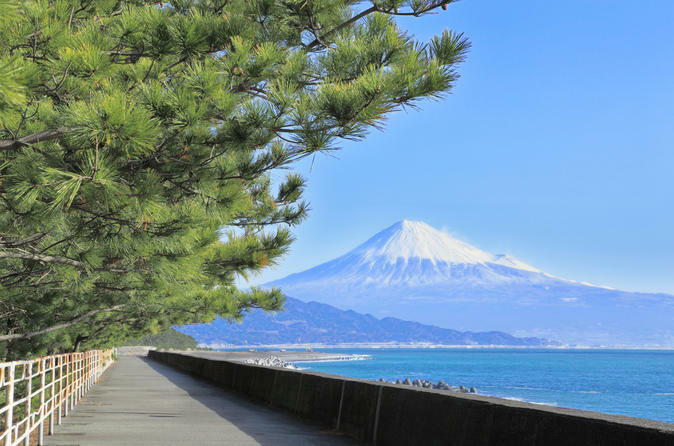 Get off the cruise at Miho port and then head to Miho-no-Matsubara, a part of Mt Fuji’s World Heritage Site. This scenic site is unique with more than thirty thousand pine trees lining the beach. Strolling for 50 minutes to see the pine forest beside the beautiful beach and the sacred Mt Fuji in the background. At the end of the day, you will head back to Shinjuku. The approximate arrival time is 18:30.